Hello, I make websites for business and musicians! 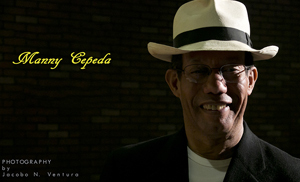 Welcome to my portfolio site, my name is Manny Cepeda. I'm currently living San Diego, California, a paradise like no other. I have been working with Web Design for just over 3 years now. Seeing the web evolve everyday in so many ways keeps it all to exciting and fresh, and being able to communicate effectively the connection between the provider and the user via this captivating medium makes it all that much more exciting. What can I say... I Love It! I am a musician and a web designer consultant who helps musicians and bands get jobs and become known in the industry by using the best resourses in the internet. Finished a successful career as an Enlisted Bandleader in the US Navy Music Program and embarked into my own music business. The need to promote my band presented a challenge and that was the motivation to go into web design. The lack of knowledge and frustration with some webmasters cost me business leads and prime venues by not having go SEO work in my site. Soon I started to realized that I either stayed as a follower or take the lead into promoting my website. Came out with my first CD promotion and no one knew about me except for my close friends. Something was very wrong! After careful considerations, I embarked into the studies of web design and after 10 years without attending college, I decided to enroll full time and study web design form top to bottom. After 3 years of web design work I am now number 1 on Google Searches under "Classic Salsa Bands in San Diego," my business is up 25% and I've also created, and maintained my own web site. My goal now is to create websites for other musicians who experienced the same issues I went through and keep their business in the internet in tip top shape. These are some of my work both as a student and as a free lance web designer in San Diego, California. I have created a couple of sites for music and I am currently engaged into working with two other artists and one non-musical company with similar requirements. If you need a new website for your business, or whether you just need to spice up your current one, I can produce a brilliant, user friendly, standards compliant website that your visitors can appreciate and trust. Praesent vesbulum molestie lacus. Aenean nonummy hendrerit mauris.